Having just returned from a whirlwind binge of Switzerland’s most scenic trains, I can say without an ounce of exaggeration that the Swiss train system is a true marvel of magic. And beyond their surplus of scenic routes, razor-sharp punctuality and Care Bear-friendly service, the crowning jewel of the Swiss rail system is, in my opinion, its glittering roster of scenic, panoramic Swiss trains – a holy grail of sorts for those traversing Europe by rail. As I’m sure you know, train travel in Europe is an oft glamourized mode of transport, a classy and elegant contrast to the stuffy conditions of air and bus travel. Well, I’m happy to report that in Switzerland, all your swankiest train dreams do indeed come true. As a Canadian who grew up far removed from train travel, I admit the concept always delighted me (thanks, Hogwarts Express!! ), and now even after so many years of frequent rides, I’m still like a giddy sugar-high child on her own moving candy shop. Take it from this fangirl then, European train travel doesn’t really get better than Switzerland. 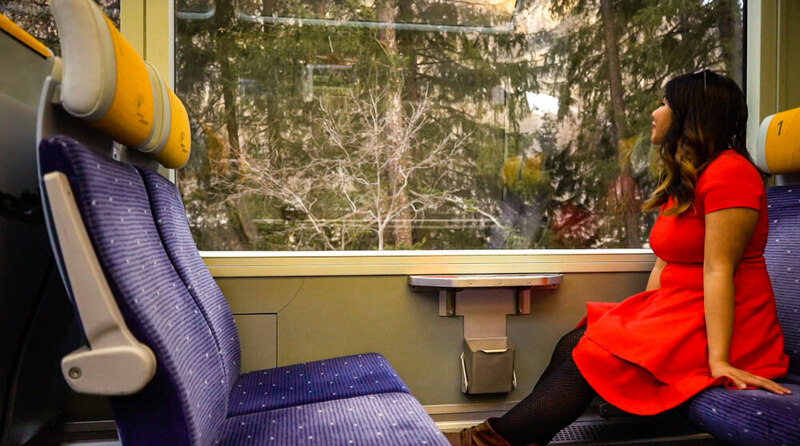 So, are you keen to try some amazing Swiss train rides for yourself? Here are some of my top picks! This Switzerland scenic train is, without a doubt, my favourite. 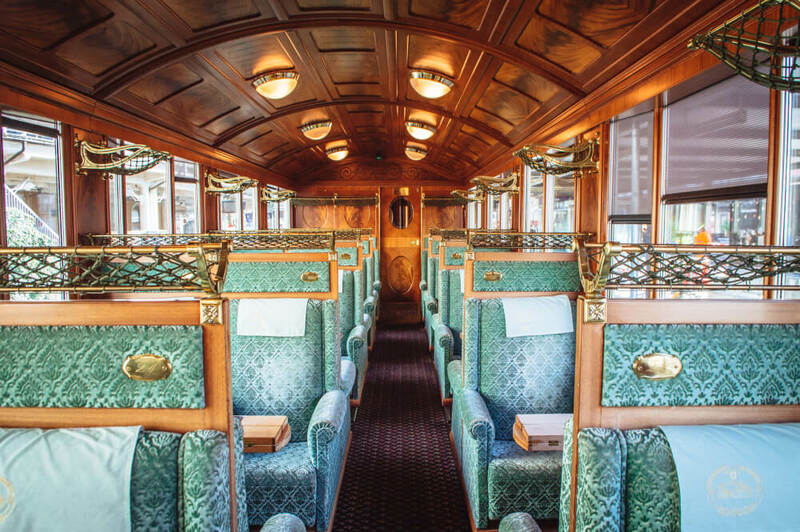 While not as famous as big Swiss names like the Glacier or Bernina Express, if it’s a touch of old world glamour and Belle Époque elegance you’re looking for, then please, book yourself on the Golden Pass Classic as soon as humanly possible. Excuse me, where is my butler? 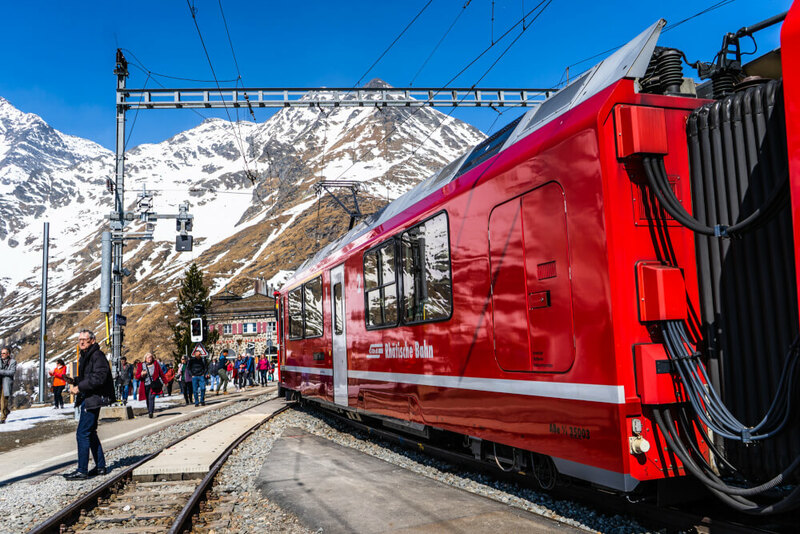 The entire GoldenPass line is a tremendously scenic line running between Lucerne and Montreux in three separate segments, offering sweeping views of snow-dusted peaks and eight glimmering lakes along the way. While the entire route is well worth drooling over, the segment from Montreux to Zweisimmen in particular is one I’d highly recommend because a few times a day, you can do the route in the “MOB Belle Époque” which is modelled after a 1930s Orient Express style luxury train. If you’re feeling especially swanky, splurge for 1st class, where you get to sit in plush green armchairs while taking in all the stunning scenery. NOTE: The Golden Pass from Montreux to Zweisimmen ALSO has trains called the “MOB Panoramique” that do the same route, but with modern cars and not the classic ones. If you really want the experience I described above, make sure you are booking on the “MOB Belle Époque”. Even dreary Novembers are better in Switzerland: blue skies, snowy mountains and orange trees! BONUS TIP: I did this scenic ride in November, and I got to witness golden autumn colours mixed in with all the snowy mountains, while enjoying the benefit of fewer crowds. I’d highly recommend this time of year for it! 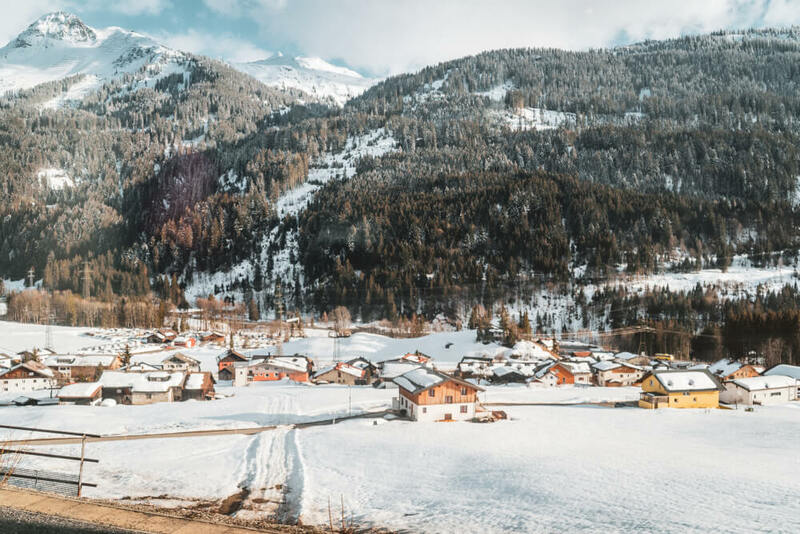 This famous Swiss Alps train ride is known as one of the most luxurious and best train rides in Europe, so it’s no wonder it’s made my list. 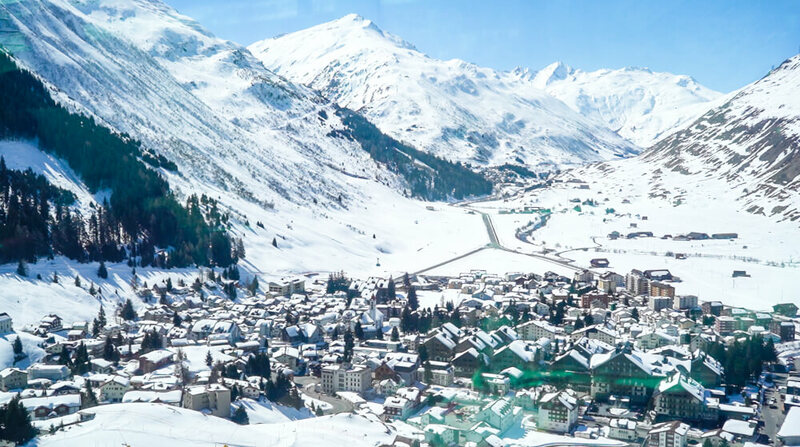 End to end, it brings you between the swishy ski resorts of Zermatt and Saint Moritz, stopping in a variety of stops like Andermatt and Chur along the way. End to end, you’re looking at a tortoise-like slow ride of about 8 hours, ensuring that it does indeed earn its title of “the slowest express train in the world”. 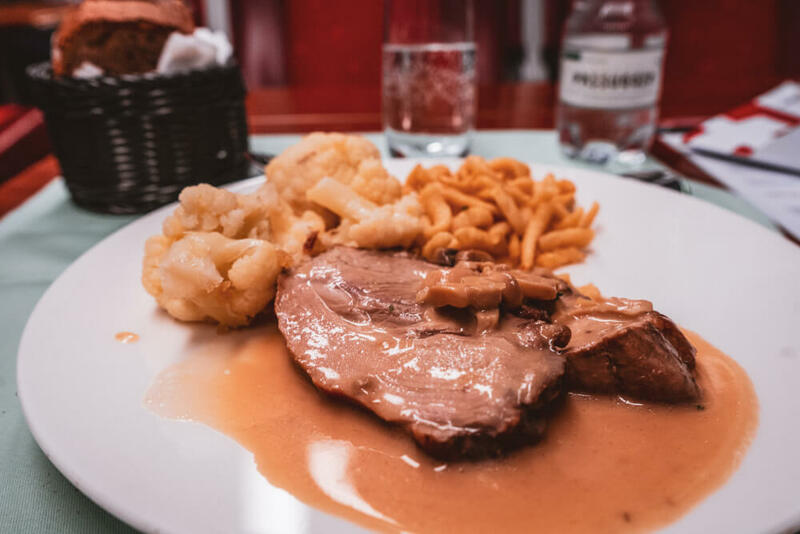 My lunch before inhaling said chocolate pudding – roast pork with cauliflower and spaetzle in a mushroom sauce! And while the Glacier Express is certainly not everybody’s cup of tea (again, it’s very very slow and takes up an entire day), I loved it for the experience. There’s nothing quite like a long scenic train ride to give you an ample dose of dreamy “I love the world” moments. Imagine giant panoramic glass windows, plush, comfy chairs, and my personal favourite: table service with hot three course meals served straight to your seat. After all, if you’re taking a train through Switzerland, why shouldn’t you be inhaling a giant chocolate pudding at the same time? 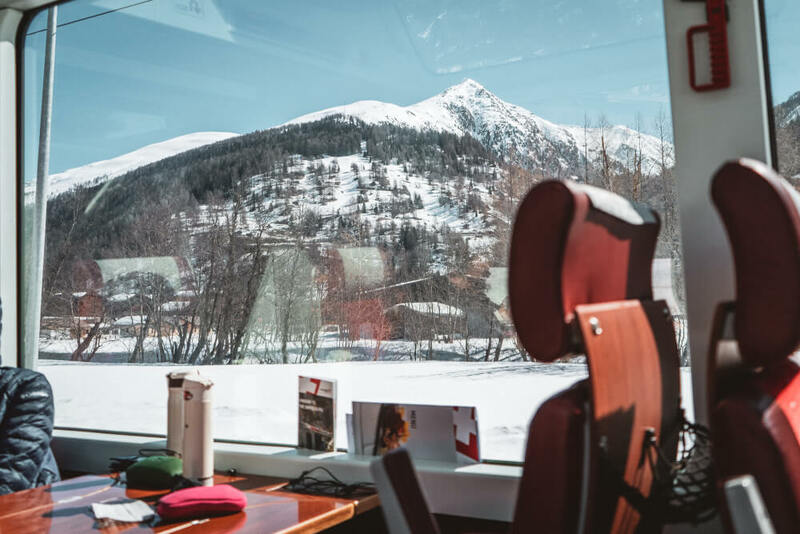 Bar none, the Bernina Express is one of the most famous train trips in Switzerland, and I’m happy to report that it does indeed live up to all the hype and buzz! 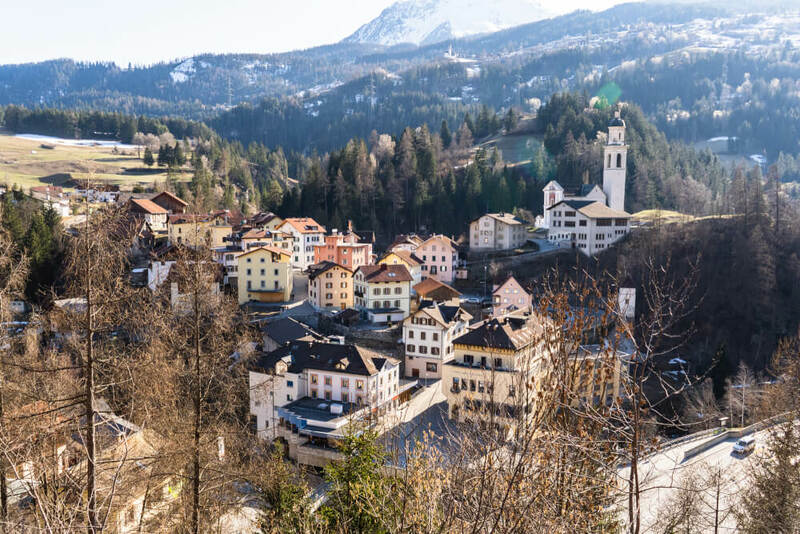 This four hour ride between Chur and Tirano is one that brings you from the snowy mountaintops of Switzerland down to the warm, balmy Mediterranean views of Italy, passing by a constant barrage of unique landscapes along the way. No doubt, if it’s excellent value you’re looking for, this is the train I’d recommend. 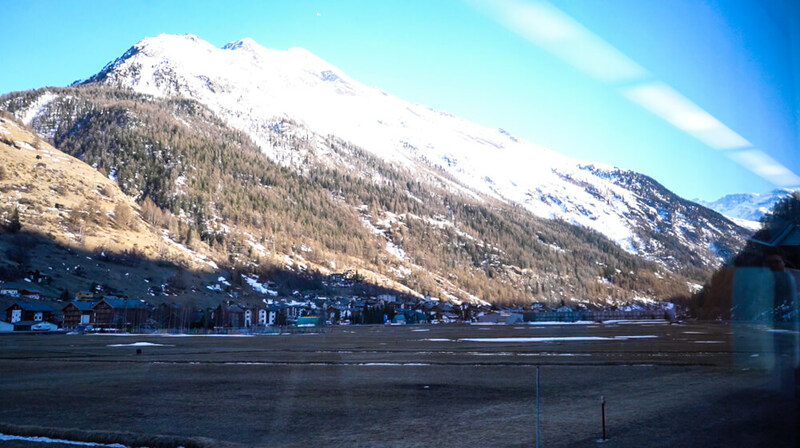 Compared to other journeys (side-eying you, Glacier Express), the Bernina Express is quite a short ride, but the diversity of landscapes you get to take in is breathtaking. 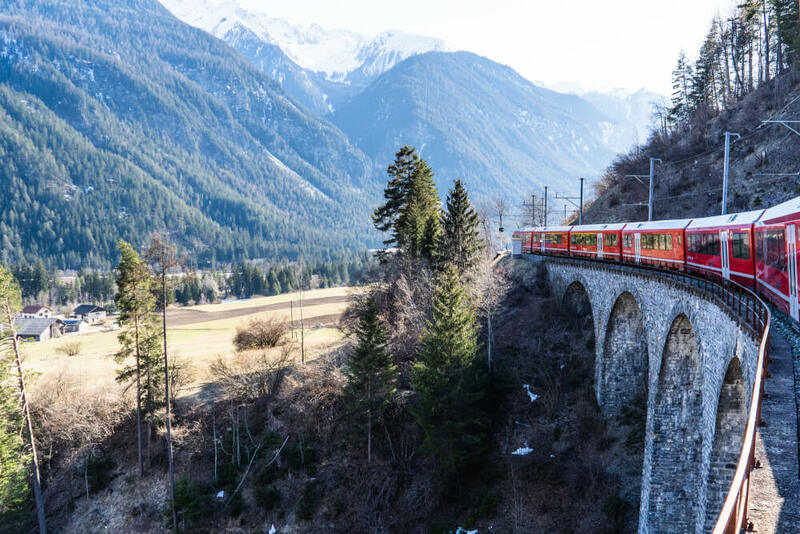 From ruined castles and fortresses to quaint alpine villages and famous viaducts, the Bernina Express is like a “best of” tour of Switzerland, all in a compact, time-friendly package. Just to warn you though, your memory cards will all run out of space, and your phone will 1000% die from the sheer beauty of it all. NOTE: If you are a keen photographer, or prefer to avoid touristy crowds, I would actually recommend doing this ride using regional trains instead. More on this below! It’s definitely not the most well known of all Swiss train rides, but I recently rode the Transalpin from Innsbruck to Zurich, and was blown away. 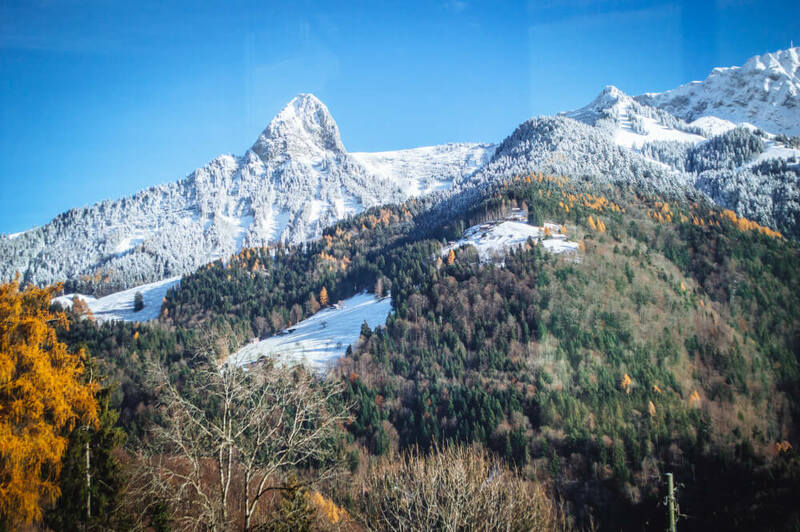 This EuroCity Express ride is one that isn’t marketed as being a scenic sightseeing experience, but is nonetheless one that brings you across some awe-inspiring landscapes in Austria, Switzerland and even the wonderful micro-nation of Liechtenstein. The scenery you pass is gorgeous, but the starring feature for me is the panoramic 1st class car that they add to one journey at day, which allows you to soak in the views with giant windows just like on the sightseeing trains mentioned above. Seriously: it’s the glamour of the aforementioned express trains, but without the crowds! It’s like a snowglobe. I mean, seriously. Why can’t I be this cute? The best part is, taking this panoramic train at 3:48pm from Innsbruck in March meant I was able to watch sunset from the train, and let me tell you: watching the sky turn fiery pink over Walensee as we weaved through the impossibly green rolling hills of Austria, then Liechtenstein, then Switzerland was pure magic. This is a lesser known Swiss panoramic train, and definitely a hidden gem that you should consider adding to your Switzerland train tour. Alright, listing the Matterhorn Gotthard Bahn is kinda cheating because the following route is technically a segment of the Glacier Express, but since the Glacier Express is a million years long and not everyone has the luxury of spending a full 8 hours on a scenic train, I would recommend the Matterhorn Gotthard Bahn from Visp to Zermatt as an excellent taste of the Glacier Express experience. Imagine staring wistfully outta thiiiis! 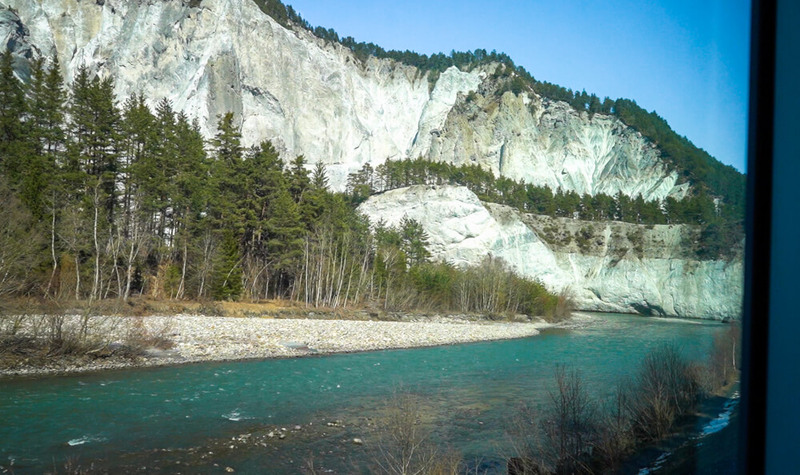 Not only do they have panorama cars just like on the Glacier Express, the rugged scenery here (I would argue) is one of the best parts of the entire GE journey. Leaving from Visp, you pass by rocky mountains, terraced vineyards, turquoise rivers, and of course, as you approach Zermatt, snowy Alpine towns and even the famous Matterhorn if you pay attention! I didn’t, and managed to miss it, although thankfully I got some great views of it in town! 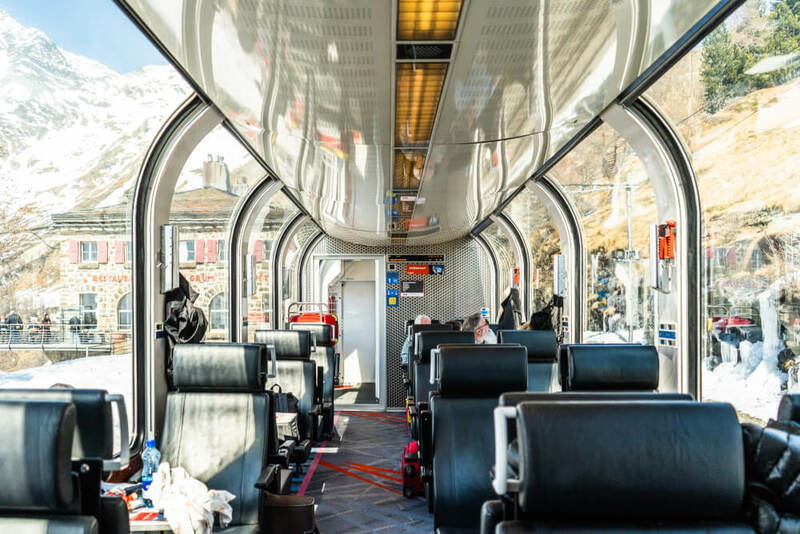 If you want to experience a panoramic train in Switzerland without paying a reservation fee (and without the accompanying crowds of the more popular scenic trains), then this is a great option. 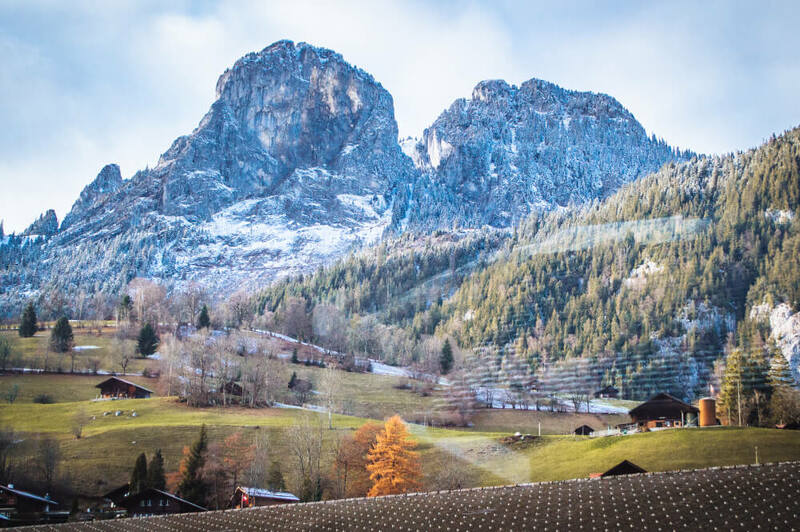 Train travel in Switzerland is next level, so naturally, the country has far more to offer than just the panoramic tourist trains mentioned above. In fact, pick any random route in Switzerland and it’s bound to bring you somewhere pretty scenic. That said, here are some of my top picks for train rides I’ve done that weren’t part of the panoramic express rides mentioned above, but are still pretty incredible (with the added bonus that they don’t feel at all touristy). So here’s a secret I’ll let you in on: all the “Express” trains mentioned above are so-named because they are built for sightseeing, and take you end to end with no stops… BUT regional trains travelling between those areas go past the exact same landscapes, often with fewer crowds, and the ability to open windows on certain trains. So, while most Swiss train tours will bring you along one of the ‘Express’ trains, if you are an avid photographer, want to save money on the reservation fee, or would like to stop at different towns along the way, then I would recommend doing the Bernina Express and Glacier Express on regional trains instead. I did this on my return leg from Tirano to Chur (AKA the Bernina Express route) and I loved the experience. I had a carriage all to myself, I could open the windows and overall, I was like a happy puppy sticking her head out a car window the entire time! 10/10 would recommend. Yes, I took this photo from inside the train! The clarity and colours of Lake Thun are seriously next-level, so if you can, enjoy the views from a train going from Interlaken to Thun. One of the biggest treats of doing Switzerland by train is being able to slowly enjoy the fairytale-esque landscapes, and as far as colourful postcards go, it’s tough to beat the short ride from Interlaken to Lauterbrunnen. Rolling green hills, towering mountains and an endless parade of lush green trees await. The best part? The view riding into Lauterbrunnen, as the iconic Staubbach waterfall comes into view. 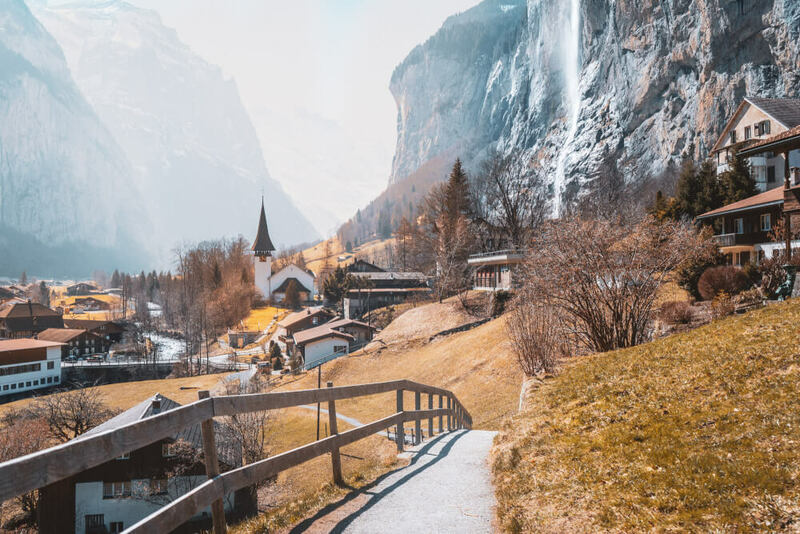 Fairytale Lauterbrunnen, just a short train away from Interlaken! 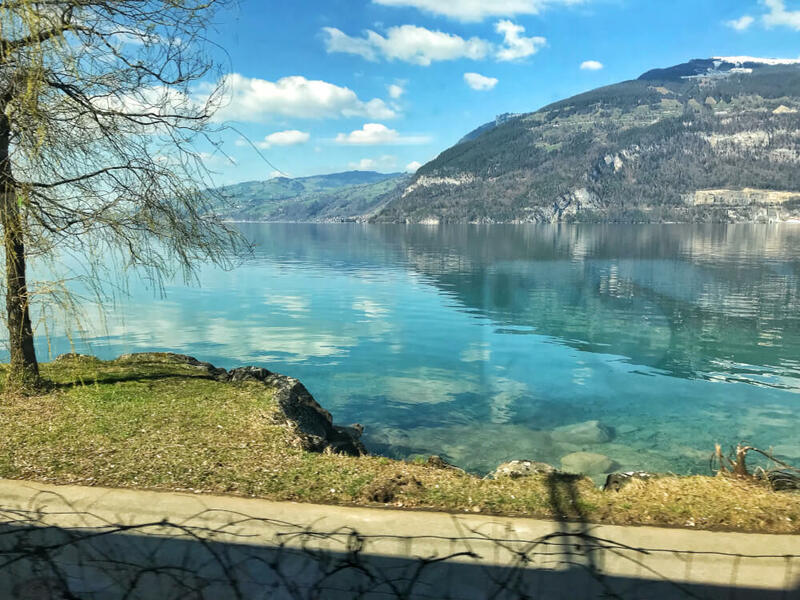 I love that this Switzerland train ride takes you past two stunning Swiss lakes: my personal favourite, the impossibly turquoise Walensee, and of course the beautiful Lake Zurich. This is a ride I’ve gotten to enjoy a few times, and it’s certainly one of my favourites. Alright, so this is another short ride, but it’s an unbelievably beautiful one that glides along the clear blue waters of Lake Geneva the entire time, with a foreground of lush green vineyards to boot. If your goal is to experience one of the nicest and shortest train routes in Switzerland, I’d highly recommend this ride, especially when it starts to tilt and swerve into Lausanne. Total bliss! 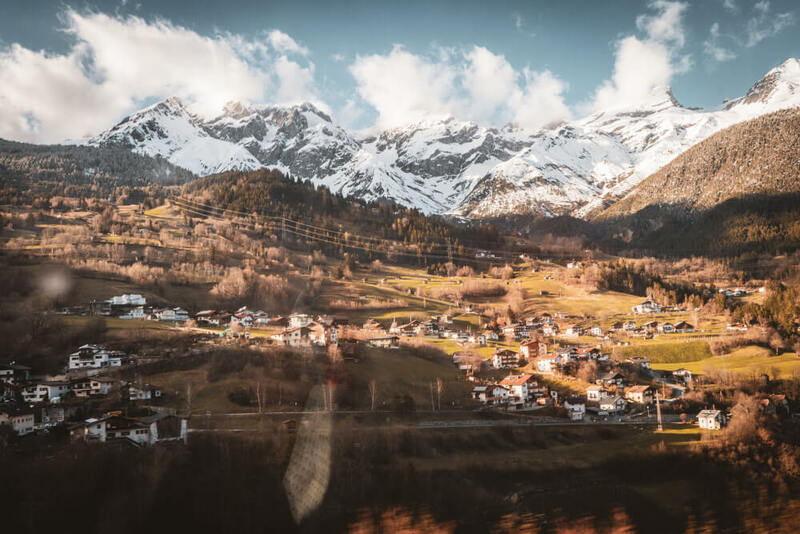 Of all the scenic train rides in Switzerland, there are very few that allow you to experience it all completely open-air, so definitely put this one on your list! 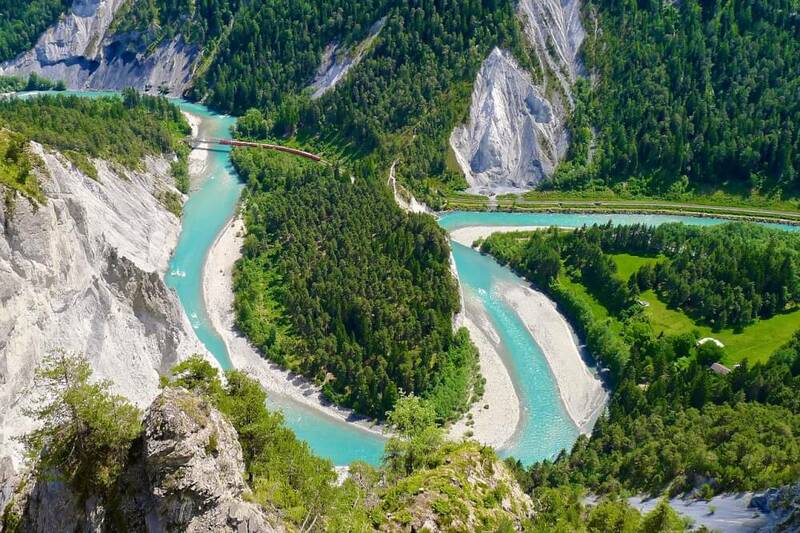 An overheard shot of the beautiful Rhine Gorge! 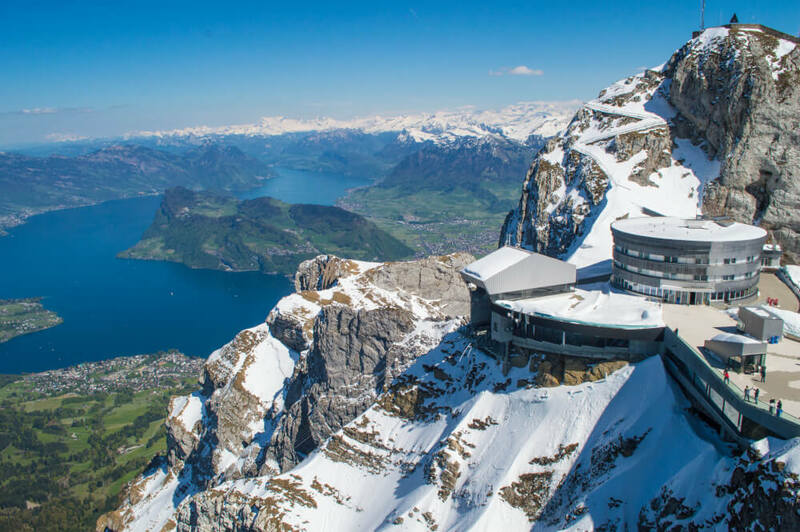 With a title like “the steepest cogwheel train in the world” you can expect the ride up to Mount Pilatus to be pretty special. 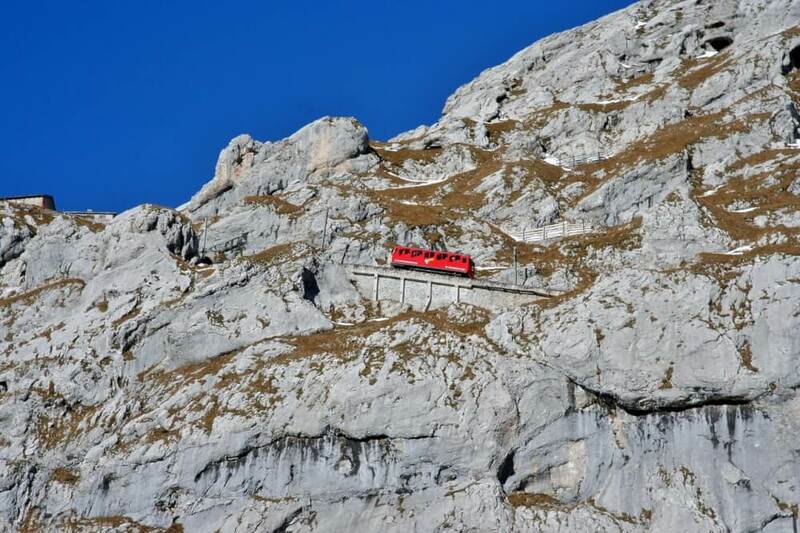 The steepest cogwheel train in the world :O Do you dare? Mount Pilatus is one of my favourite mountains in Europe, and because my visit a few years back was veeery poorly timed (snow delayed the opening of the cogwheel train by a week! ), I missed the opportunity to ride this steep monster up to the top. Nonetheless, my consolation prize was sweet enough: a scenic ride up by cable car, with access to incredible views the entire way up. 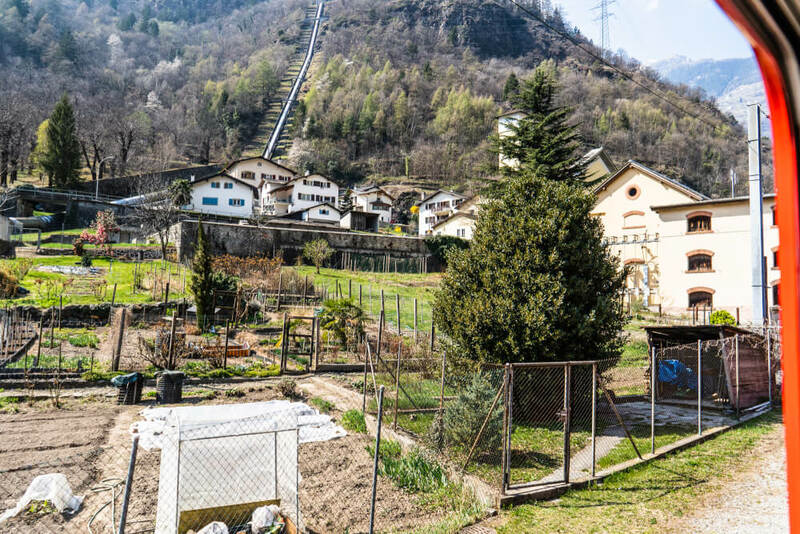 The next time I’m in the area, I’ll be sure to catch the Cogwheel train to the top instead, experiencing a nerve-rackingly steep ascent that I’m sure will make me cry a little….. but in a good way! Last but not least, we have the legendary Jungfraujoch. 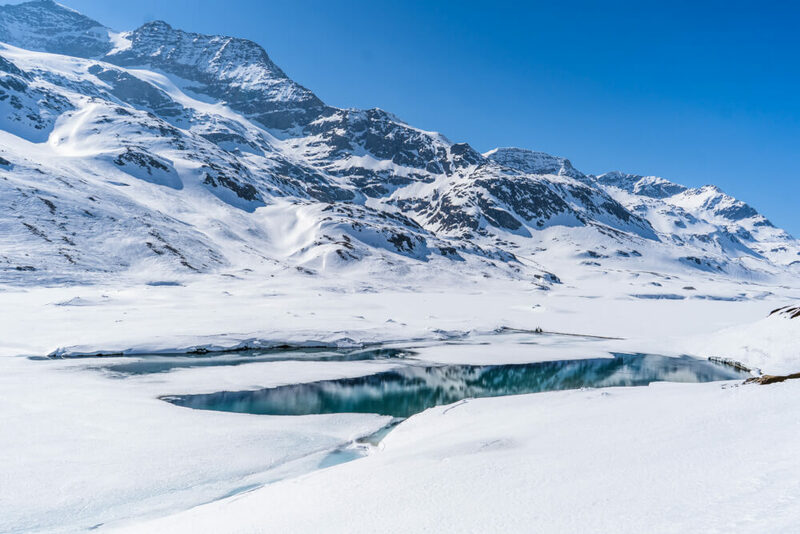 The train ride up to Jungfraujoch brings you to the highest train station in Europe, passing by endless snowy peaks along the way (if your views aren’t obscured by poor weather that is!). Truthfully, I’ve resisted doing the Jungfraujoch thus far for two simple reasons: cost and uncertainty! At an eyewatering 200CHF for a regular roundtrip ticket, this is one trip that does NOT come cheap, certainly when bad weather might mean you don’t see anything at all once you reach the top. Nonetheless, it’s a bucket list item for sure, and one that I’d be keen to test out sometime in the future, as I have heard great things about it. I did part of this journey (which for most, starts in Interlaken) from Lauterbrunnen to Wengen which was short and slow, but very nice. 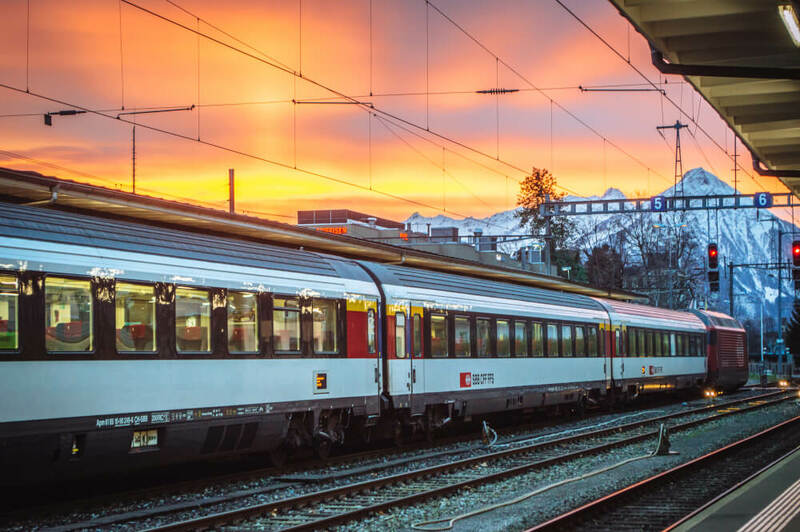 How to Buy Cheap Train Tickets in Switzerland? Last but not least, I know what you’re all thinking after reading this post… how can you possibly afford all these Swiss scenic trains? 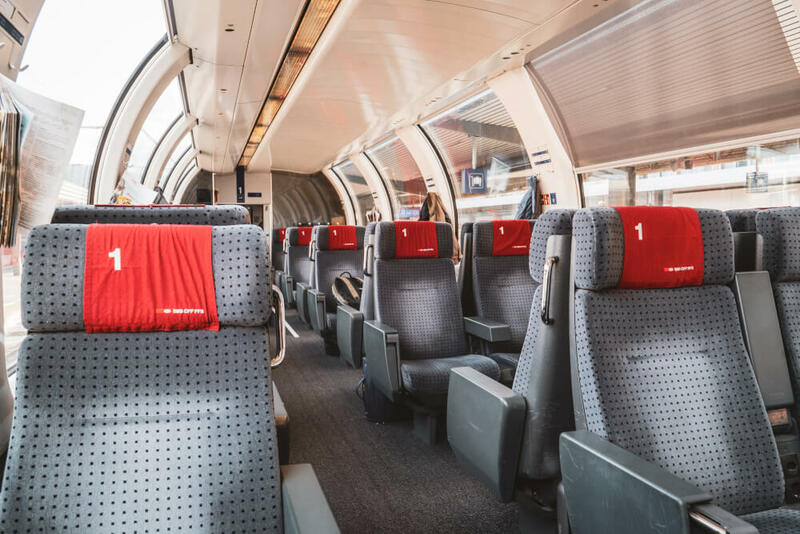 The tough truth is: enjoying Switzerland train travel is an expensive endeavour indeed, but I’ve been able to discover a variety of cost-saving hacks over the years that might be able to help you out! One of the ways I’ve been able to explore Switzerland by rail SO cheaply is thanks to rail passes! This is how I managed to scheme my way into only paying 30 euros for my 1st class tickets on the Glacier Express and Bernina Express! Long story short, Eurail/Interrail passes allow you to waive the base ticket fee which means you only need to pay for a reservation. As such, I paid 306 euros for a Eurail global 10 day pass, (I got a free 1st class upgrade thanks to a sale they were running). 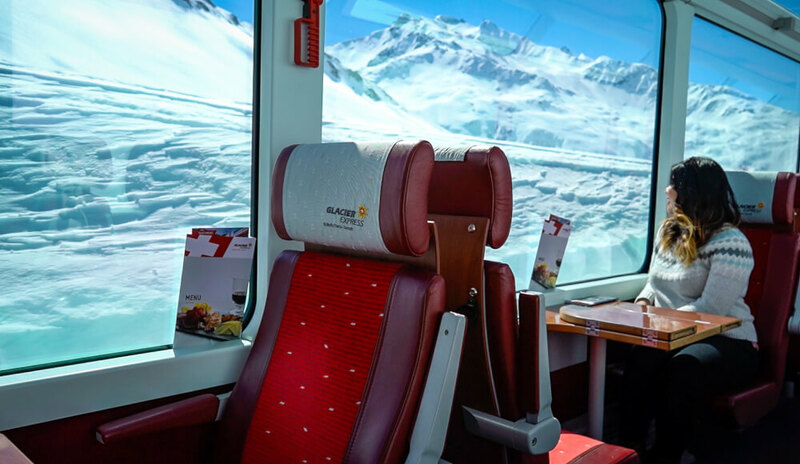 I then used 1 travel day on the Glacier Express, which evens out to only about 30 euros spent for this gorgeous ride (plus the 23 CHF reservation fee). Still an incredible deal, and by far the cheapest way to do it. This is actually how I did all my recent train rides for a rock bottom price. So, if you are travelling around Europe, getting a Eurail pass might be a good idea, because Switzerland is certainly where you get the best bang for your buck! 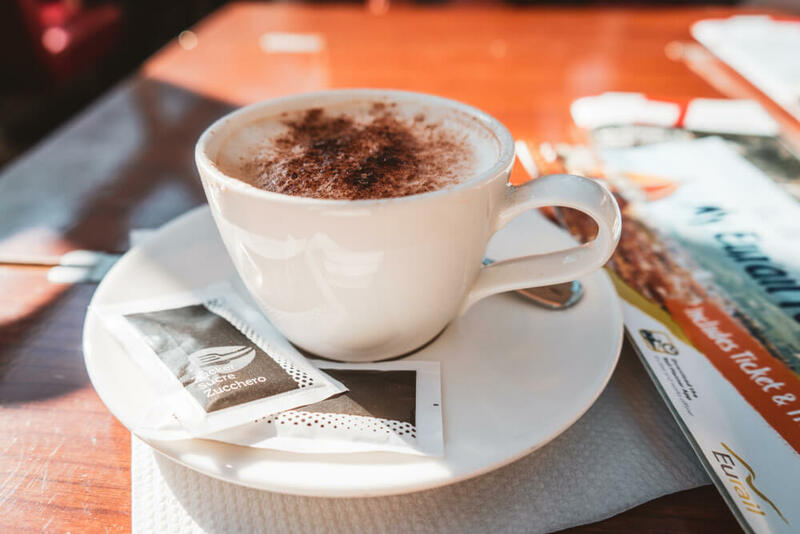 Eurail pass + caffeination… all I need in life! A Swiss Travel Pass is similar to the Eurail/Interrail passes except it gives you unlimited transportation on trains, buses, boats and free public transport + museums). If you are travelling only around Switzerland, this might be a good option. It is expensive though, so make sure to do the math and see if getting one would really be worth it. If you only plan to do one Switzerland train journey, buying a point to point ticket will most likely be cheaper. Click here for more info on the Swiss Travel Pass. The Half Fare Travelcard is a very popular card that you can buy which (true to its name) gets you half price tickets across Switzerland. In 2019, this card is 120 CHF for one month. 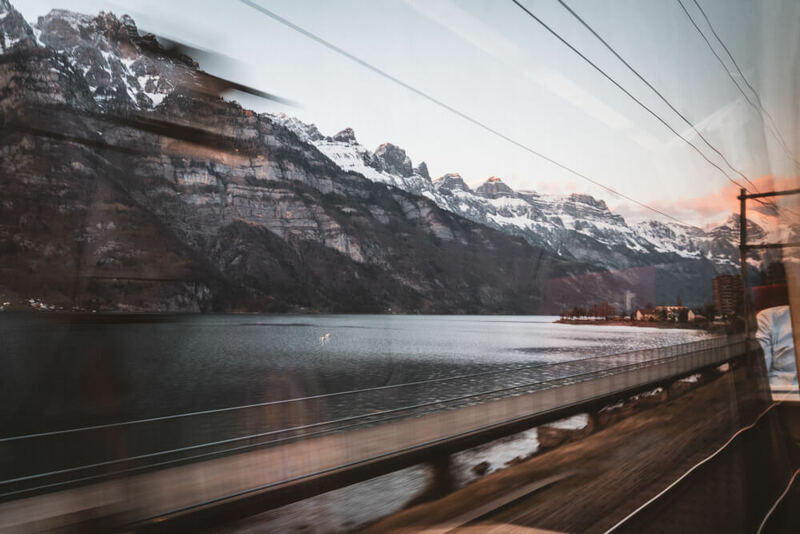 This sounds like a lot, but it could be worth it if you are spending an extended amount of time in the country and plan to take multiple Switzerland train trips throughout your stay. For what it’s worth, if you were to use this card for the Glacier Express alone, you’d already be breaking even so if you take more trains on top of that, then you’d definitely save a good amount of money. I still think buying a rail pass would work out to be cheaper though in most cases. This tip is mostly just for the Glacier Express, but I’ll include it anyway. 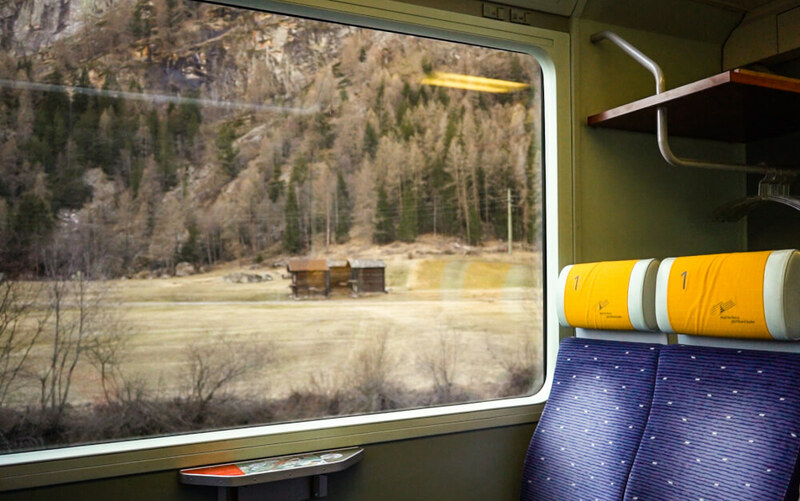 While base ticket prices do not change, reservation fees for panoramic trains can change depending on whether you travel in the off, mid or peak season. If you want to get the cheapest ride, go in the off-season which A) means guaranteed snow!! and B) half the price on a reservation. Any more recommendations for scenic train rides in Switzerland? 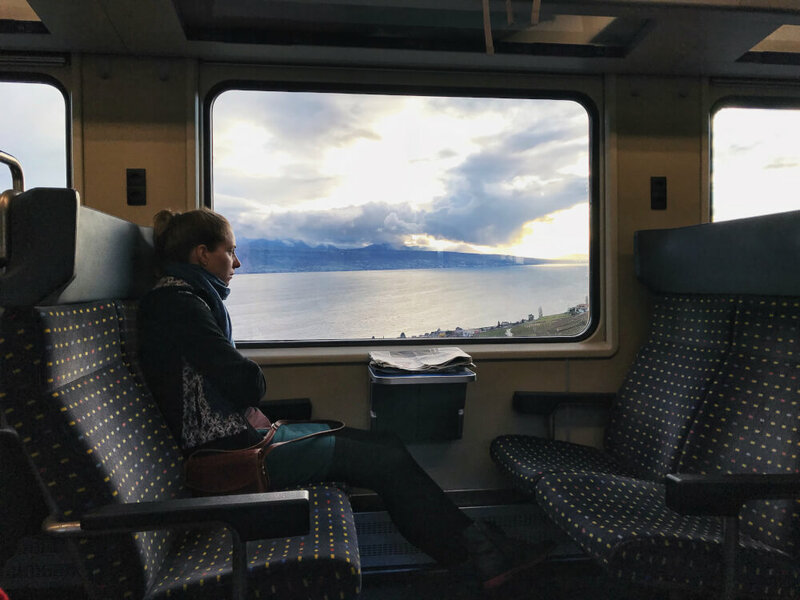 I hope you enjoyed this post all about Switzerland train travel and the best Swiss railway journeys the country has to offer! 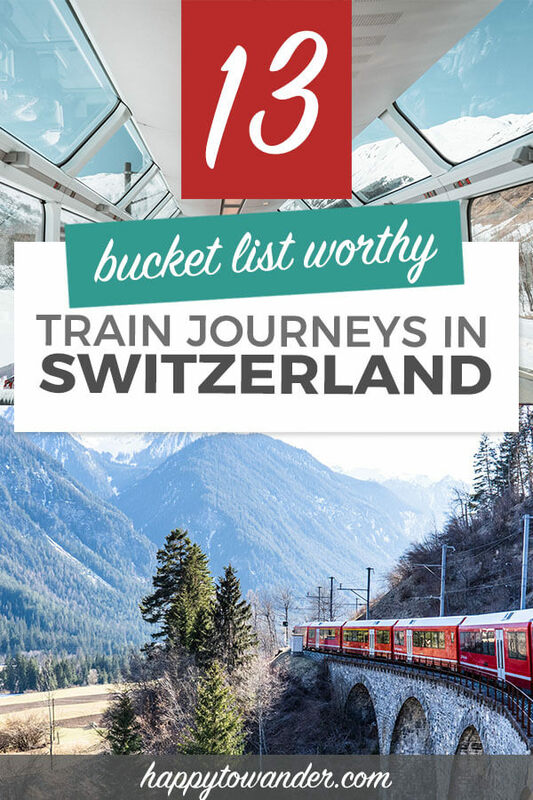 All that said, I’m always looking to add more Swiss trains to my list – especially hidden gems 😉 Let me know in the comments! Oh my goodness! 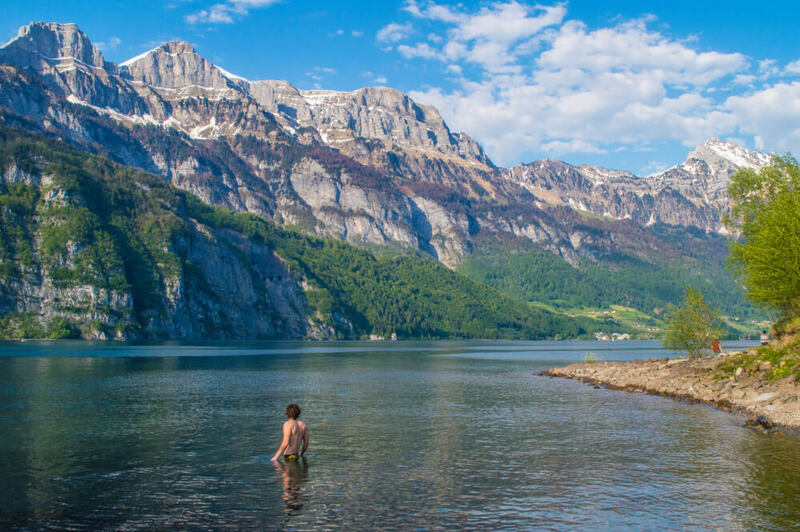 I am dying to go to Switzerland and your post confirms why. How stunning! I’ve always dreamed of riding an old-fashioned train through Switzerland, so I think the Glacier Express is for me! The photos you captured through the train windows were breathtaking. Wow, these look amazing. Would love to do one of those one day. 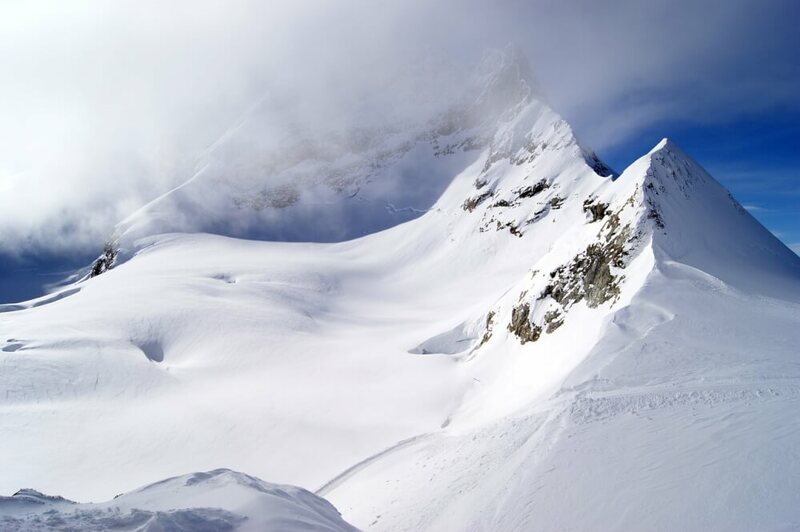 Nothing quite beats the snowy Swiss scenery. First of all, I didn’t realize that Switzerland had so many trains, but this proves me wrong! Now I need to go try them all!! !